From mountain streams in the west to rolling prairies in the east, Montana's habitats and natural resources offer an abundance of culinary possibilities. The mountains provide the necessities for a delightful elk tenderloin with huckleberry demi-glace, while the prairie contributes to rattlesnake cakes with roasted red pepper remoulade. And gardens and farms statewide produce the makings of Aunt Lois O'Toole's rhubarb strawberry pie. 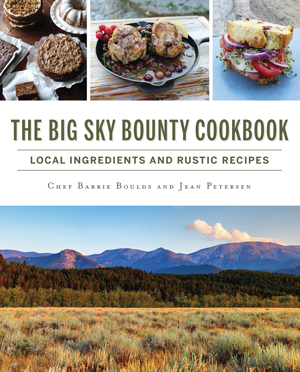 Chef Barrie Boulds and author Jean Petersen present locally sourced epicurean dishes that exude Montanan charm. Historical context enhances seventy-five easy yet sophisticated recipes celebrating unique flavors and heritage—with forewords from Chef Eric Trager and Western Ag Reporter editor Linda Grosskopf. Montana-born chef Barrie Boulds (chefbarrieboulds.com) brings more than twenty-eight years of experience to her private chef and catering business in the Yellowstone area. She has been featured in Wine Enthusiast magazine, the New York Times, Fodor’s and USA Today and has served clientele from celebrities to presidents. A graduate of Colorado State University and member of the Society of Children’s Book Writers and Illustrators, Jean Petersen (jeanpetersen.com) has more than twenty years of professional writing experience as a columnist with Western Ag Reporter and nonfiction children’s author.